Effective hedge-fund investing requires hands-on hedge-fund experience. For over fifteen years, Magnitude Capital has built and managed global, multi-strategy hedge-fund portfolios and related vehicles. Our intent has always been to deliver attractive risk-adjusted returns that don’t depend on passive risk exposures. Our Investment Committee and other senior personnel share extensive prior experience inside hedge-fund organizations. We believe this hands-on training improves our understanding of markets, managers, strategies, and their interactions over time. Our leaders are experienced industry professionals. They are chosen for both their capabilities and their commitment to firm values. The following important factors should be considered when evaluating the awards received by Magnitude Capital, LLC (“Magnitude”). 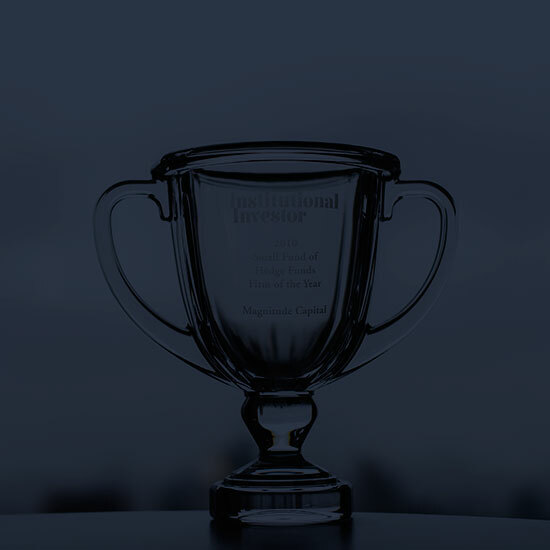 Awards were generally given based on a combination of quantitative metrics (including returns and Sharpe ratios) and subjective judgments about investment managers and their products made by the institution sponsoring the award (or a panel of judges selected by the sponsoring institution). The universe of investment managers and products considered for these awards was generally limited by the sponsoring institution based on various factors. Such factors may have included, among other things, one or more of the following: investment strategy; length of track record; assets under management; whether the investment manager reported information to the sponsoring institution’s database; or other factors considered relevant by the sponsoring institution. Magnitude does not vouch for the integrity or objectiveness of any selection process in connection with such awards. For the awards listed, Magnitude was the sole recipient of each award in the applicable year. Magnitude has been nominated for other awards in addition to the awards mentioned herein. Past performance is not indicative of future results.